When I was a child one of my favourite memories is of a trip my parents took me on to see Paul Daniels who was THE magician of the time. People my age will remember his catchphrase. "You'll like this. Not a lot." That was a long time ago but magic is still a big hit with children so I thought I'd share details of a new show from time-travelling magicians Morgan & West who are offering More Magic For Kids! at the Underbelly Festival Southbank between 29th May and Sunday 4th June. Expect the unexpected, believe the unbelievable, but do not dare miss the unmissable Morgan & West, the perfect family show this half-term, ahead of the Edinburgh Fringe Festival in August later this year. Despite their squabbles about the idea of creating a show for children, Mr West has finally resigned himself to the idea that he now does shows for children, although he’s really not best pleased about it. Mr. Morgan, as ever, is thrilled that people are willing and indeed eager to watch him and his magic tricks. Join in the fun as Mr. West wants to prove that he’s better than Mr. Morgan, and indeed silly children. No doubt his comeuppance will come as More Magic For Kids! prepares to unload another boxful of bewilderment and impossibility. What could possibly happen next? More Magic For Kids! sees the magic duo set out to provide entertainment that is delightful for anyone of almost any age (5+), from any time period, and any level of maturity. The result is a marvellous show that is loved by both adults and children alike and will keep you entertained from beginning to end – the perfect family day out! 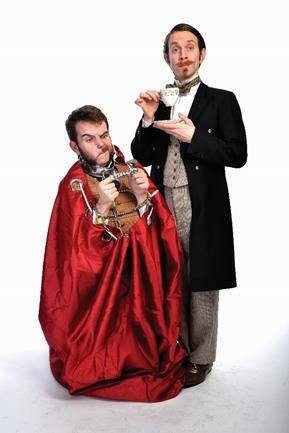 Morgan & West have performed their outstanding magic shows across the globe to sell-out crowds during 2 UK tours, at the Edinburgh Fringe, Perth Fringe World, Adelaide Fringe where they were nominated for ‘Best Family Show’, and Buxton Fringe where they were awarded ‘Best Comedy Show’. They have also appeared on Penn and Teller’s Fool Us (ITV), The Slammer (CBBC) and The Next Great Magician (ITV).